We let the zoos be for now. I hope they become a place of refuge and education, as they should. This is a post about Marlfield Lake inhabitants who are free to move around as they please. The low fence is protecting them from the visitors who can fall in the water and frighten the chicks. I have mentioned Marfield lake in one of my last year’s posts. Robins live an average 2 years, but it all depends. If there are no predators, the weather is good and the food is plenty they might live a decade. This particular robin has been around for some 5-6 years. Of course I cannot tell for sure that it is exactly the same robin, but I think I recognize the behavior. 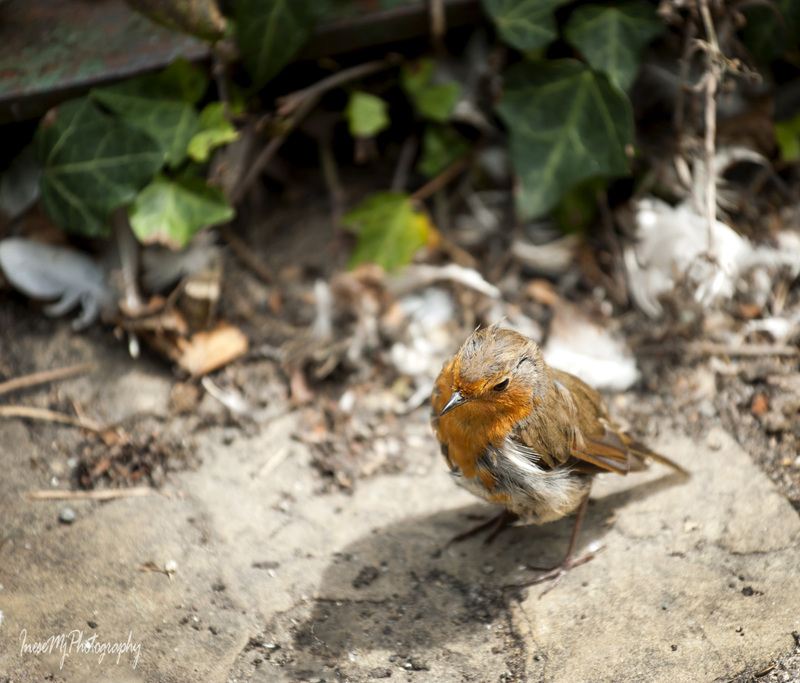 As it happened, during my latest visit the robin had been moulting. He probably could not fly well, so he hid in the shrubs and came out only to pick up some crumbs. 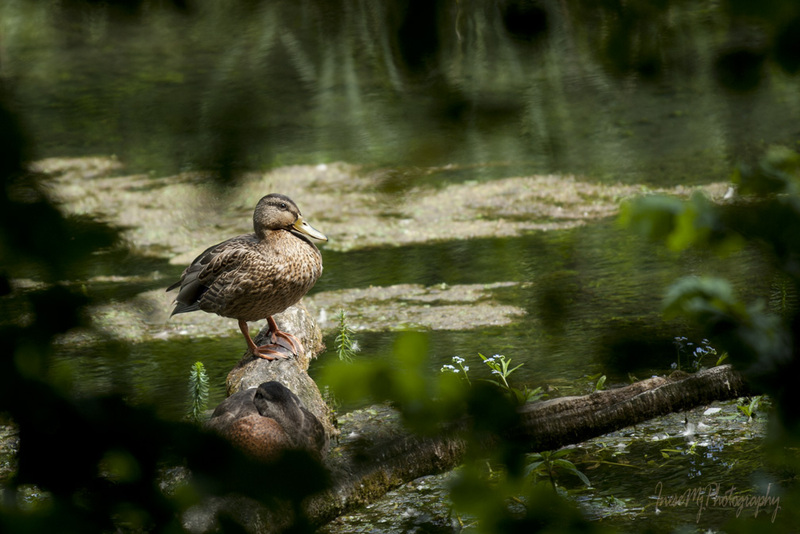 A century-and-a-half long history of feeding the local waterfowl with bread has probably made them sort of domesticated. 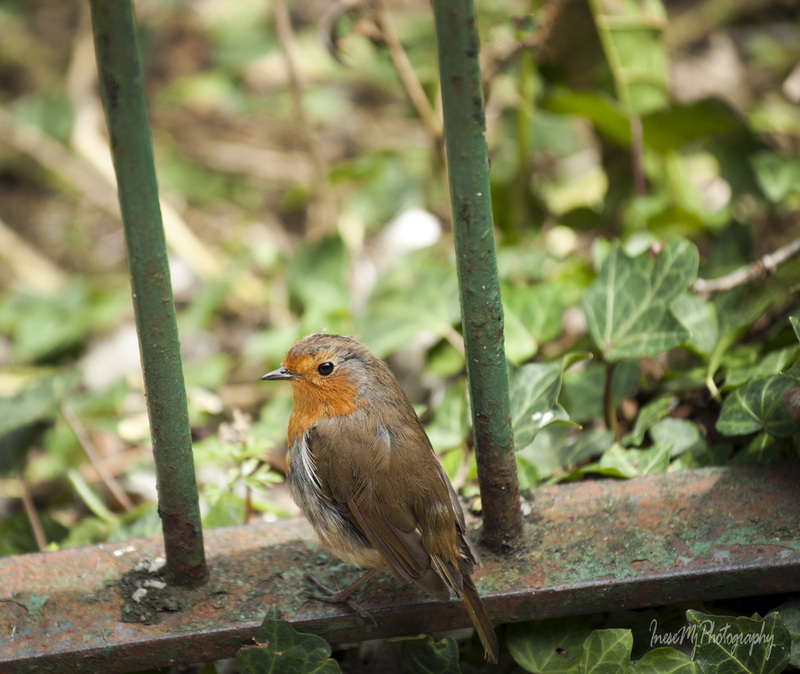 After the lunch, robin comes from behind the fence to visit with me. When there are no dogs around, this robin can come quite close. He is a great poser. Look at him! He is standing right next to my feet. 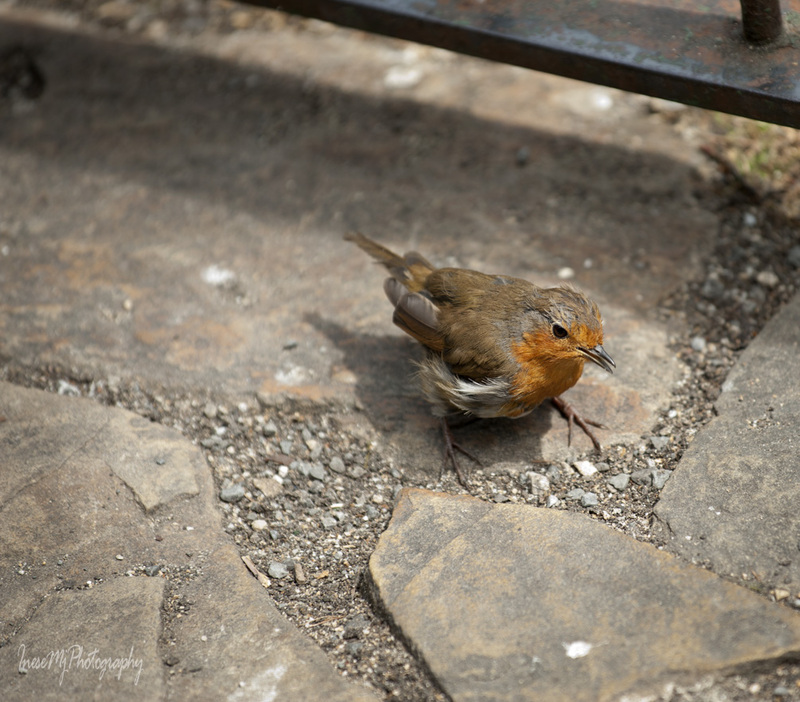 The robin is hopping around, picking something invisible from the cracks in the rocks. I notice something else, and say bye-bye to him. I swear he knows the word. 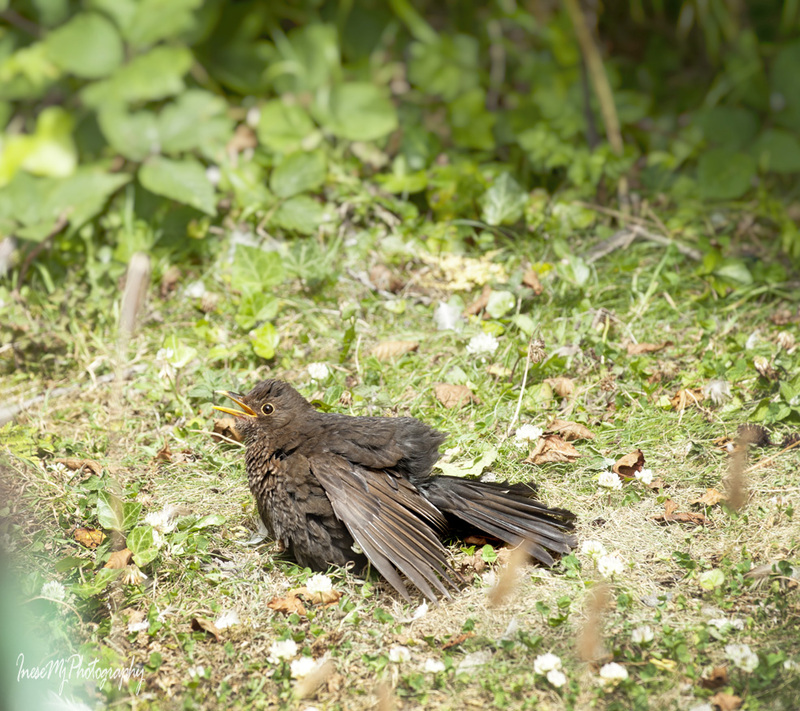 ‘Something else’ is a young blackbird that sits on the ground behind the fence with his wings spread wide. There is nothing wrong with him. He is just cooling himself. … and this is his mate and their cute fluffy cygnets. 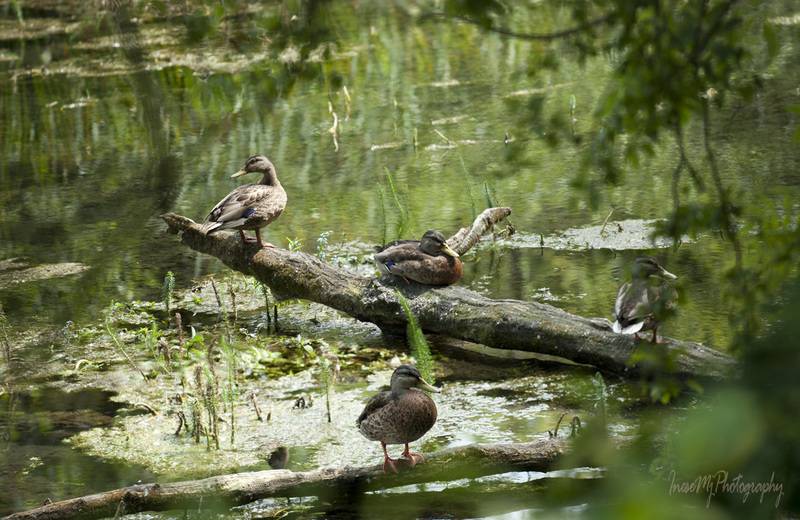 I also spot four female ducks strategically perched on a fallen tree, minding each other’s back. If you think that I have posted too many bird pictures in this blog, here are two butterflies and two very useful herbs for you. Red Admiral – Vanessa atalanta, a very common butterfly around the Marlfield Lake. Fragrant Pineapple weed is good for your stomach. When you crush its feathery list between your fingers, you feel that sweet pineapple scent. If you taste a flower head, it has a light citrus flavor. Hedge Woundwort smells like mouse urine – so they say; for me it is just a very unpleasant aroma. Woundwort is a very powerful antiseptic remedy, healing to the wounded tissues. Beautiful photo’s. 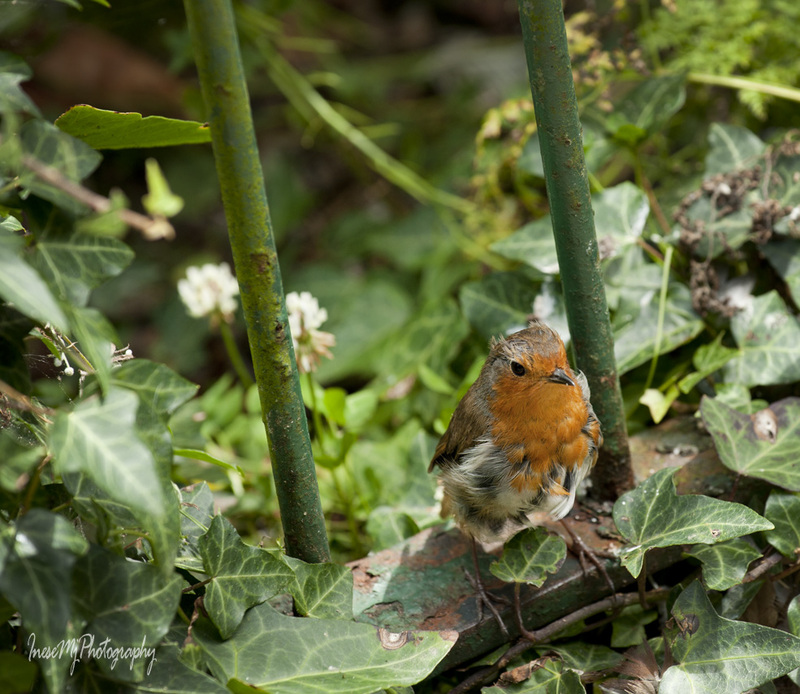 I too felt a little nostaligic looking at the delightful robin photo’s. Although I live in Australia I have fond memories of the robins in England. They were so cheeky and did not seem too bothered by our presence. They would come quite close to us and stare back while we admired them. Thank you for this lovely post. Love the 3rd photo ~ as it reminds me of a sight I’d see almost every day when I was a kid and every morning a robin would come and sing…my sister and I would always get excited by this, Your photos and writing brings back a great feeling of nostalgia ~ perfect for a nice autumn day. Wishing you well Inese. Thank you so much, Dalo! I am glad that my post brought back good memories. Our robins might look different than yours, but their songs are equally delightful 🙂 Have a happy Halloween weekend! Thank you so much for joining me on this walk! Those European Robins are cute. Are they seed eaters? The American version have an uncanny ability to find and extract earthworms for their dinner. BTW, you asked an earlier commenter about our juvenile robins. They’re already larger than wrens, and their breasts are orange but have a lot of dark speckles – that kind of threw me off when I first started learning bird id. Thank you Dave! It is interesting that the juveniles look pretty much like the adult birds. 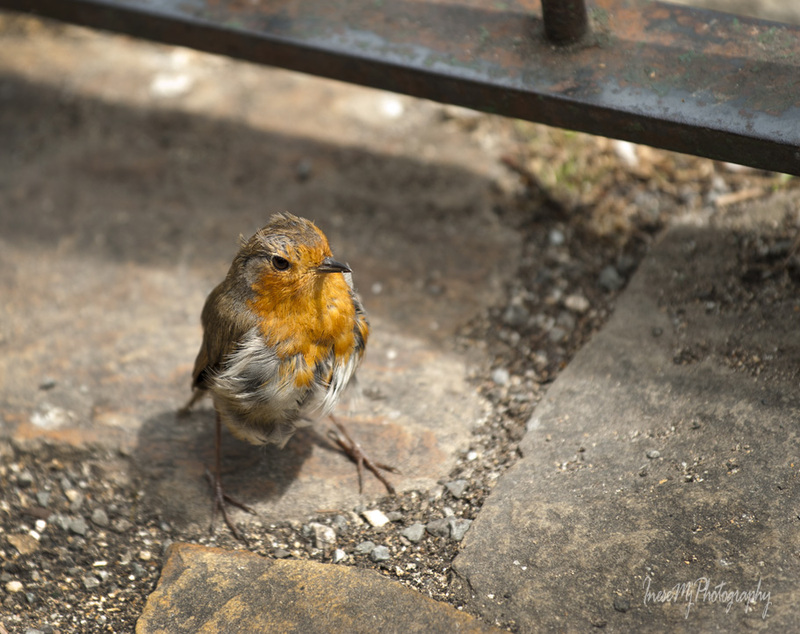 A couple of months ago I posted a picture of a juvenile European robin, and it has no orange breast feathers. All speckled brown. I love to watch American robins when they hunt for the earthworms. They look pretty fierce 🙂 Our robin eats insects and some fruit. His bill is not strong enough to dig the earthworms out, but he would eat them if they were on the surface. The robin looks so cute! It must have felt comfortable in your presence to come near you. I think animals seem to always understand what we are saying. You could speak to them in any language and they get you. It’s quite amazing! 🙂 I loved every capture of yours. These days, I’m fascinated by butterflies. Thanks for taking me on this little journey in the wild. Thank you for thinking of me and I must say an apology. I wish I had been the first one here, dear friend. I didn’t realize it is harder to fly due to less feathers. Poor baby. 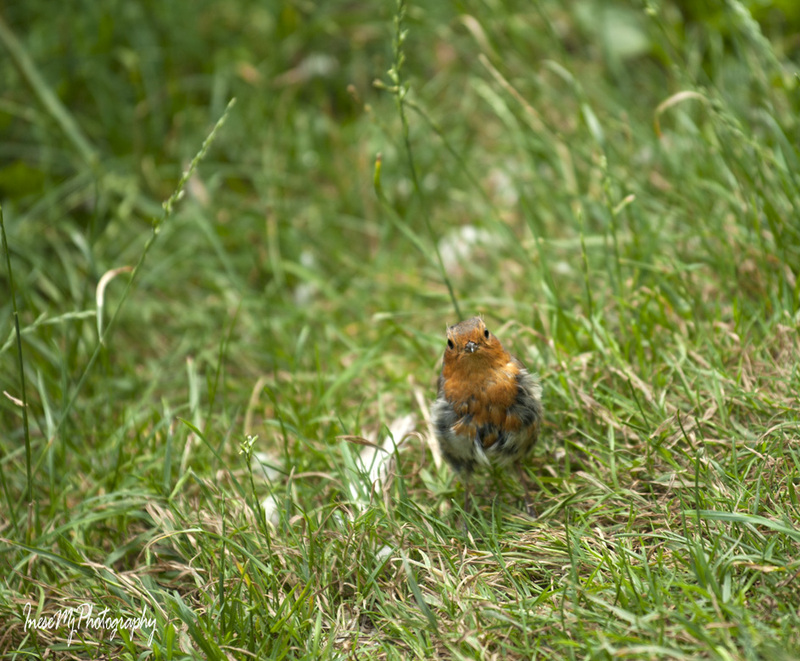 Robins in your part of the world look like small, adorable wrens with red chest and white fluffy feathers. I liked the special butterflies. The red admiral may be common at this lake and area but I thought it was quite beautiful. 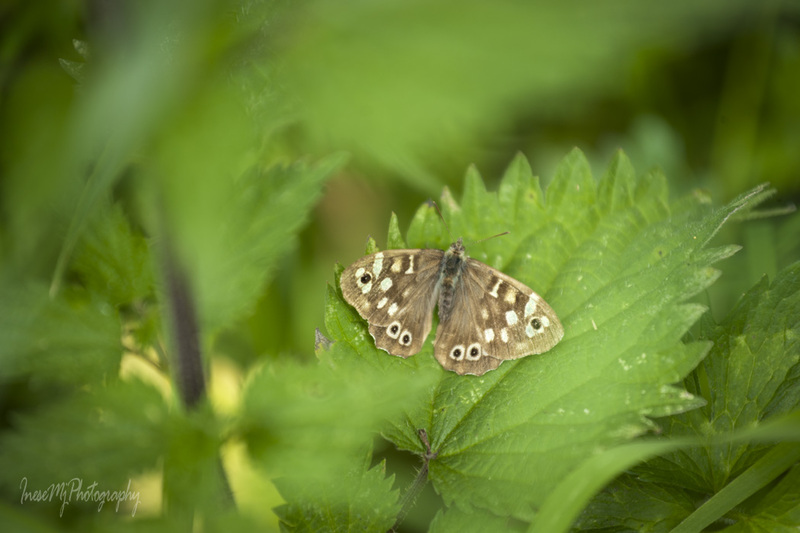 The speckled wood butterfly was very nice, too. It would be able to blend in well. I’m glad you balanced those birds with pictures of butterflies ; ) Oh boy, I hope the little robin stays safe. My husband has bird friends that he also names and stresses over. I am sure the birds understand a lot, and know their names. You should see the way my robin pricked up his ears when I said ‘bye-bye” 🙂 He looked very disappointed. Nice images! Do you encounter many butterflies? I have bad luck, especially with moths. 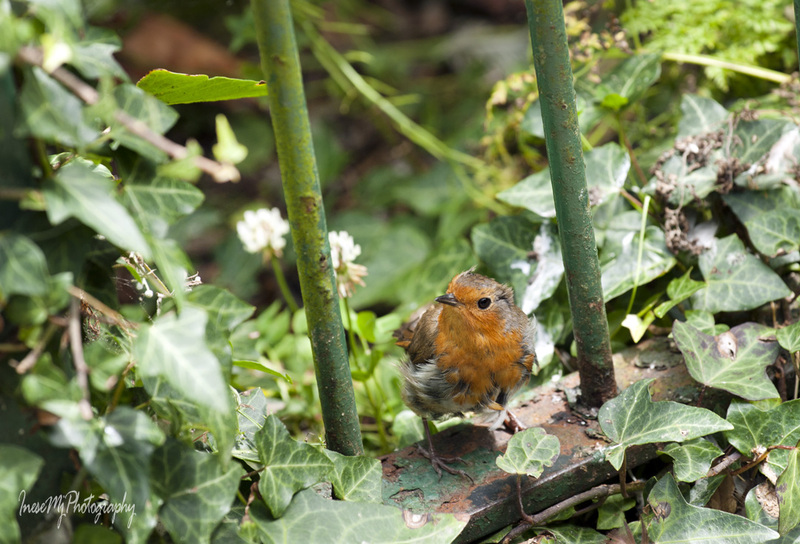 Really enjoyed your robin pix – I think everybody loves robins. We do not have so many in Florida but up north they were everywhere. Love the butterfly pix too – they are definitely different from the ones around here. Enjoy your break! Thank you so much! 🙂 This summer I only managed to catch two big butterflies with my camera. I was very delighted even though the picture is not good. The other butterfly came out much better and I will share the picture in one of my posts later this winter. I like the idea of the ‘sort of domesticated’ robins at Marlfield Lake. Your little friend is a delight, Inese, and I hope he lives a few more years. I didn’t know that robins could reach ten years old – although I did note the ‘ideal’ conditions you listed for that to happen. The fluffed up blackbird is lovely, too, as are the other bird species. And red admirals are gorgeous. We’ve had a lot this year on our buddleia davidii bush. 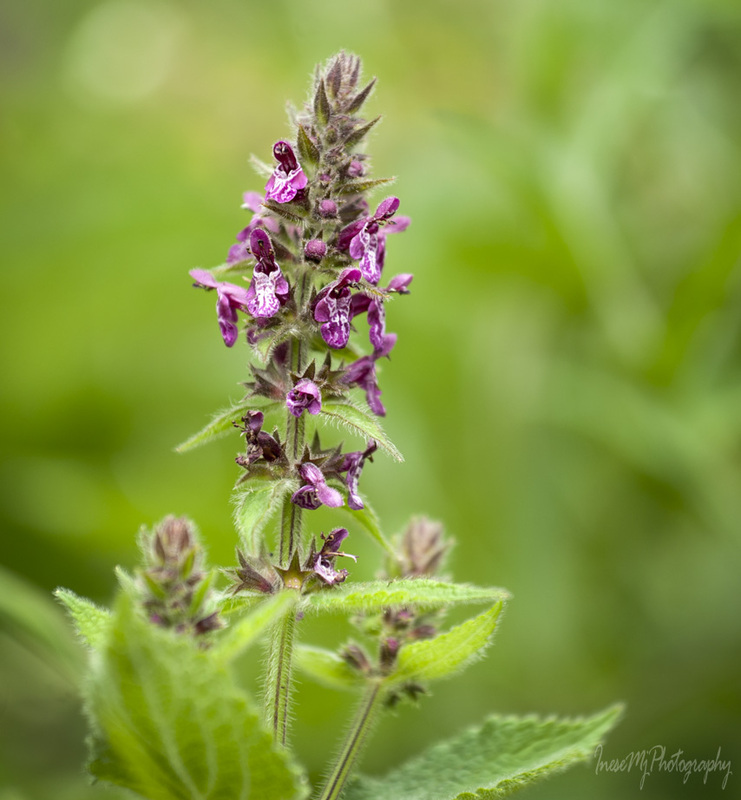 A delightful post and I had a laugh at the Hedge Woundwort that smells like mouse urine. I wonder what that has evolved to attract or repel? Thank you Millie! My book says ‘ mouse urine’, but I have no opinion 🙂 I absolutely love this plant, even though it is quite stinky. This robin will always have food, and I hope the birds of prey ignore a tiny skinny bunch of feathers. Now I think he might be even older than six years. What a marvelous post, Inese! Your little robin really made me smile. Such an inquisitive face. Yes, he definitely knows you’re talking to him. 😀 Enjoy your break. I’m looking forward to your ghost story. Hugs on the wing! Thank you Teagan! Enjoy your weekend! Another gorgeous post, Irene. I always see one robin in my garden, but I don’t think it can be always the same one. Thanks for the colour, Inese. With the horrible weather today that has made my day. Look forward to the Halloween post. Robins do seem tamer than a lot of other birds. there’s one that visits my garden frequently, but as to whether it’s the same one as six years ago, I’m not sure! It like my holly tree in particular. My mother has one that feeds out of her hand. They have a wonderful song, even if sometimes in translation they are trading insults with other robins and making it clear whose territory is whose. 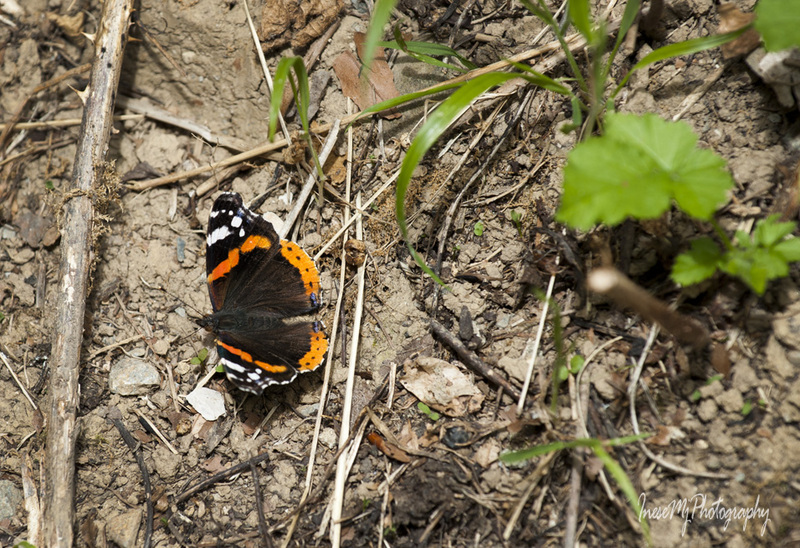 I’ve seen a lot of red admiral butterflies in the last week or two, having hardly seen one all summer. It seems a bit late in the year to me, so I’m not sure how much longer they will last. Thank you so much, Sarah. It is amazing that your Mother has tamed a robin. Amazing trust. Yes, the birds fight quite often, but at the same time a group of siblings can be very close until they find their mates. I went to the lake in July. 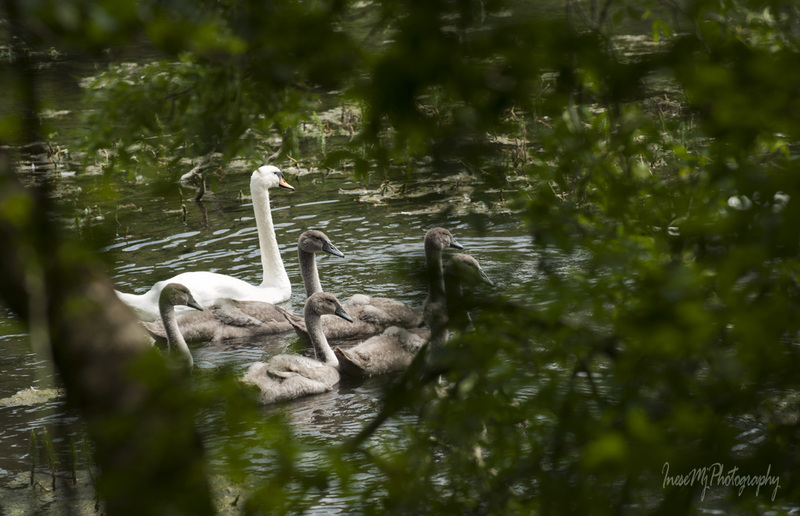 I imagine the cygnets are all grown up by now, and all the butterflies gone. My mother has a way with birds and absolutely loves them. They are extra well-fed on her territory! Thank you! No it was not my heart attack, but the other blogger’s who commented on my post. I am very close to a heart attack though :). I am having a long flight next week and I am terrified. BIG (((HUGS))) and a safe flight!!! Take it easy. No pressure. Prayers sent your way. I never tire of your bird photos. The butterflies were also captured beautifully. I’m excited to read your ghost story! What a handsome robin. They always look as if they know how wonderful they are. I don’t get tired of your birds and butterflies, flowers and weeds and walks. Have a wonderful break, Inese. Have a great trip, Inese. I think your Robins are prettier than ours by a long way. They act more like our finches, based on my limited time ‘over there’. Thank you! 🙂 American robin is as curious and funny as ours. I love watching one in my daughter’s backyard. The robin family lives there many years. Ou Robins are pretty accepting of the people who live where they nest year after year and as a small child I’d try to sneak up on them. They’d wait a bit then fly 20 yards away, not a problem for them. Our Purple or House finches, once they know you even talk to you, chirping about something. Not sure what, maybe telling us they want more seed and water. OK. Next year. :). I have found that city birds and country birds of the same species react to people quite differently. Absolutely agree with you. I have been thinking of this many times. I think this is another proof that animals like you and as you mentioned before you also speak to them. I am guessing that you also spoke to the little robin too. He is so cute and looks so fragile. Many bird pictures but they are lovely. Thank you! 🙂 I was afraid that it was too many, but you know, I just wanted to share. It doesn’t happen too often that a bird lets me come so close. He was a delightful little bird. It makes you feel very good and surprising to see another specie that normally stays away from your of fear comes close. I admire Robins. Solitary birds for the most part, Did you give this one a name, like I’ve done with Brian the Sparrow down at the harbour? Thank you! 🙂 No I didn’t give him a name. If I lived closer, and visited more often, I might. Robins listen to human voice, they are interested in humans. Very curious fun birds. I thought ‘Brian’ the Storm should have had a name with more impact. What a lovely place! Thanks for sharing your friends with us. The robin is adorable even if it was molting. The swan family was serene. I like that you finished with herbs and butterflies.. Thank you! Together, they make a walk memorable. What a cool place Inese. I love the little birds, they are so cute. 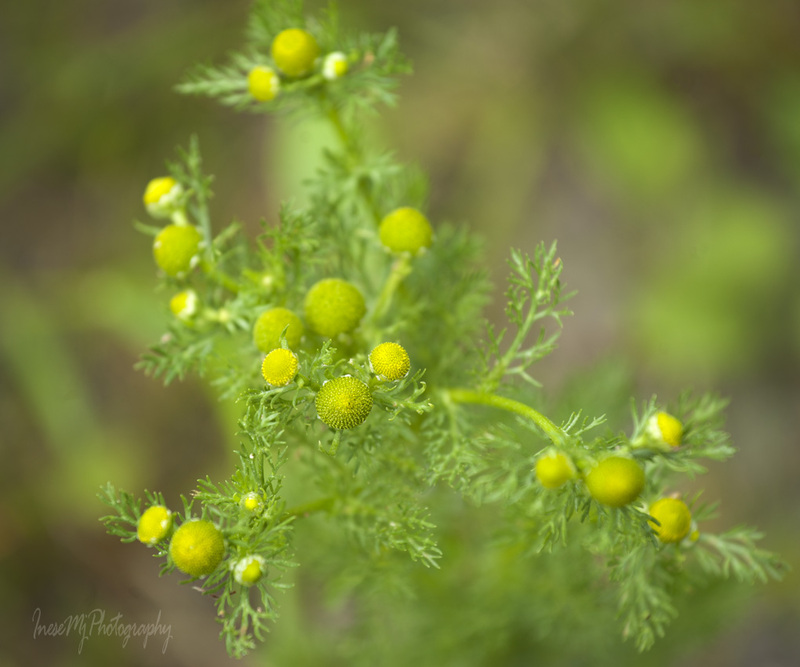 I have never heard of Fragrant Pineapple weed…interesting. 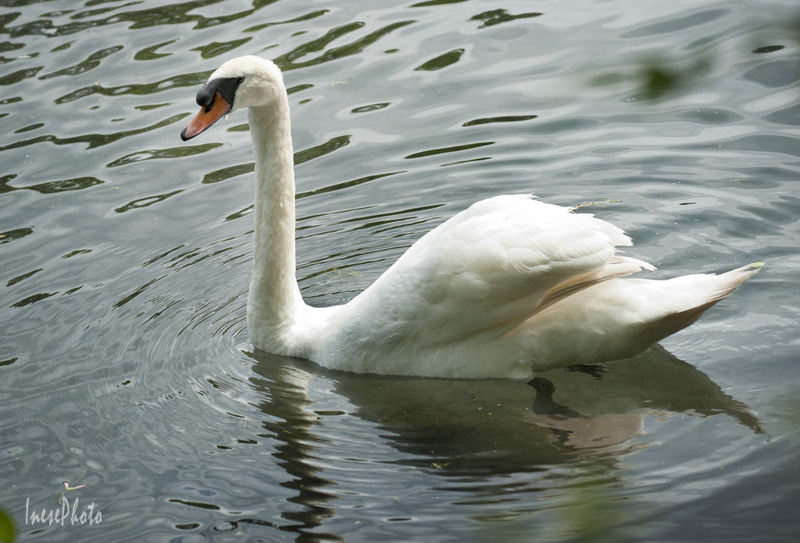 As always, your photos are beautiful, especially the way you captured the swan. Thank you Antonia! This weed grows on the worst soil, around the paths, in the farmyards. The fragrance reminds me of chamomile, just more fruity. As ever, these photos are an utter joy:). Thank you so much for sharing them, Inessa. Such nice images. The Robin and you seem to be old friends. You know, they are careful because the dogs and children chase them, but the ducks are sometimes sleeping on the road, and the drivers always slow down when they pass the lake. You are right. Hadn’t thought about kids and dogs. Our grandson is fascinated with animals… (We need to teach him slowly that there may be good dogs and mean dogs…) And I can imagine drivers slowing down… Ah! Civilization! No one wants to feel guilty killing a sleeping duck, I guess. A dog has bitten my eldest. Quite bad. A big puppy in training for K9. He just wanted to play, to catch her, but he was too massive. Oh no… That becomes traumatic. I hope there will be no scars or sequels? There will be a scar, under her knee, but it will go away in time as she is very young. Most important is that it didn’t make her dog -o- phobic 🙂 She understands that it was not an attack. The owner was traumatized the most. All good then. One learns through trial and error. I was bitten by a dog once when I was 7. I was petting it on the head and ears. (Then the owner told me the dog had sensitive ears… tsss) I am now careful with dog ears… My main concern with kids and dogs is the face. When they are very little the kids’ face is at the level of the dog’s muzzle. So one has to teach them how to approach the dog (not to get bitten in the face) Well. Glad it was “controlled”. Yes, you are very right about that. When the kids grow taller, that changes the story. Beautiful post. 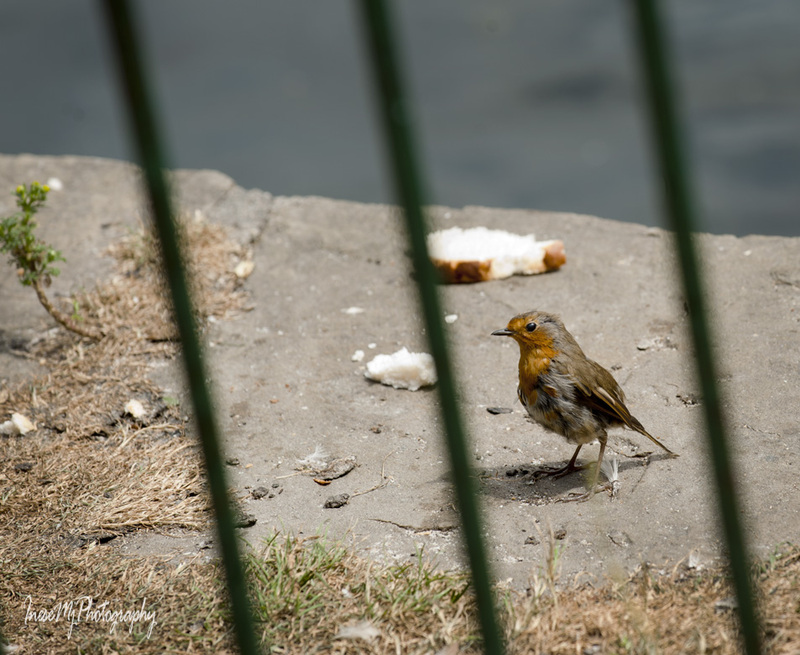 Where are live we are told not to feed birds bread as it bloats up in their stomach with water and fills them and they do not got on to feed on other things they should. Also many have died from botulism. Best to bring seeds with you. I know Joseph, that would be very good for the birds, but this lake is there for some hundred years, and people have been feeding waterfowl with bread from the beginning of time. I don’t know if any warning would help. The robins and the blackbirds have their nests nearby and always pick the crumbs. I am not bringing bread. There is plenty, and not all the birds eat it. The ducks from the far end of the lake seldom come here. They eat weeds. Enjoy your trip to your family. We’ll be in touch. Thank you Brian! You have been everywhere, and I am sure there is something in each place that is close to your heart, and evokes warm memories. Wishing you all the best, and most important, safety for you and your loved ones. Thank you Inese. All the same to you. You will likely be delighted to see the grown new baby and the older one, and your daughter… Enjoy your trip. It will be a memorable trip. Wishing you all the best. Beautiful little robin! Our American Robin is quite different in appearance. spring is just around the corner. Thank you! Yes, they are different in appearance, but quite similar in their behavior. Both curious and brave 🙂 We have them here all over the year.